There is praise and respect for one who, rather than looking for fame and glory, perfects his or her craft, shares knowledge and innovates for the greater good. Dan Welden is such a person. 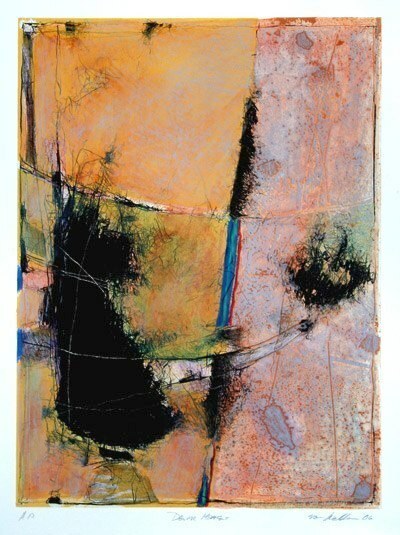 For 40 years Welden has been making prints and works on paper. He is a painter, teacher, author and Master Printmaker, collaborating with artists who include: Willem and Elaine de Kooning, Jimmy Ernst, Dan Flavin, Esteban Vicente, David Salle, Eric Fischl, among others. Recently, fame has caught up with him and this year alone he has been invited to participate in several prestigious events including an artist residency in California and another in China, where one artist from each continent was selected to attend the Ling Shi Biennial at which he also gave the opening celebratory remarks. 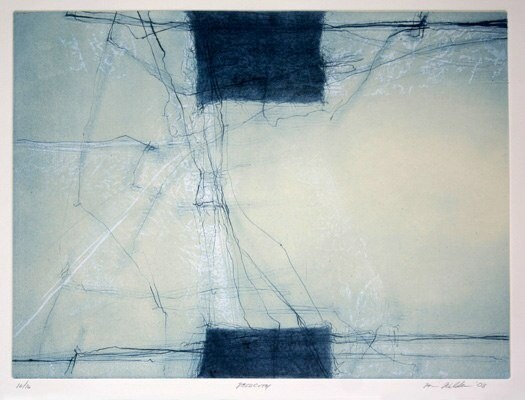 While a printmaker, which connotes multiples, many of his pieces are originals. Starting with his callographic print, Welden adds graphite and paint to create a unique work of art that he calls a Hybrid Print. Others are limited editions of small runs. It is not only his technical expertise that makes Welden’s work stellar, however; it is his imagery. Welden’s works are lyrical abstractions that flow across the paper with a lightness and a sense of space that we can get lost in. Several pieces seem like enlarged sections of a map with its varying terrains, but of where? Welden’s color, line and texture combine to evoke a sense of the familiar rather than location, of feelings of space rather than place. In this work we can venture with Welden into the unexplored topography of his imagination. Welden’s work has been shown in over 65 international solo exhibitions in museums and galleries and over 500 group exhibitions in the U.S., Europe, China, Australia, New Zealand and Peru. His work is in many public and private collections throughout the country including the Amity Art Foundation, Connecticut; Baltimore Museum of Art, Maryland; Portland Museum of Art, Oregon; and Temple University, Pennsylvania. Welden is the originator of the non-toxic printmaking technology called Solarplate, which has revolutionized the process. He is the Director of Hampton Editions, Ltd. in Sag Harbor, Long Island where he lives and has his studio.